Responding Well - to those who have been sexually abused is offered by the House of Bishops as it the Church of England's official guidance on a subject which, as all too many people are aware, has been an area of grave difficulty for the world church in recent times. The Church of England has been working very hard to learn lessons from a difficult past and to ensure that the very best practices are applied when survivors come into contact with the church.It sets out a clear statement of the general principles of the Church on this aspect of safeguarding and the practical responsibilities of the Church of England - from the central structures to the dioceses and parishes. This document has been authorized by the House of Bishops and is essential reading in this highly sensitive area. 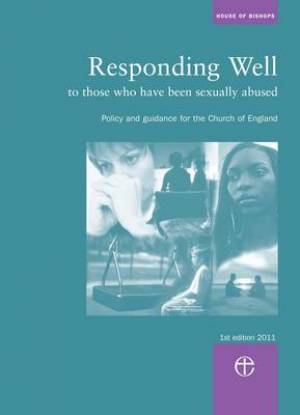 Responding Well by Elizabeth Hall was published by Church House in July 2011 and is our 24758th best seller. The ISBN for Responding Well is 9780715110577. This document is a statement of the general principles of the Church on this subject and sets out the responsibilities of the Church; form the central structures of the Church of England, to all the dioceses and parishes. A number of detailed appendices provide further background and information, including: myths and realities, mental health information, theological reflection, sources of further resources and support (with website addresses – editor) and a glossary of terms. Got a question? No problem! Just click here to ask us about Responding Well.